This is my kind of summer dessert; it's so light and refreshing, and has a nice hint of salt to balance the sweetness. Serve it as a simple and elegant portion, or you could also add a little fresh tropical fruit such as mango, paw paw, lychees or rambutans. You can have this dessert all prepped and ready to go well in advance; just do a quick assembly when you're ready to serve. 1. For the granita, combine the castor and palm sugars with 50 millilitres of water in a small saucepan. Stir over a low heat until the sugar dissolves. Bring to the boil and remove it from the heat. 2. Blitz the pineapple in a food processor and strain the juice – you will need half a litre of juice. Add the sugar mix, lime juice and lime leaves to the pineapple juice and combine. Pour the mixture into a non-reactive tray or large plastic container so that you have a thin layer of liquid. Cover with plastic wrap and freeze for a few hours or overnight. 3. Bring two and a quarter litres of water to the boil in a large saucepan and add the tapioca. Boil for six minutes, or until the tapioca is almost transparent, remove from the heat, cover and set aside for 10 minutes in the water. Drain and rinse under cold water. Transfer to a bowl, stir in the coconut cream and salt and spoon into serving dishes or glasses. Refrigerate for at least 15 minutes before serving. 4. When you're ready to serve, scrape the granita out of the tray using a fork. 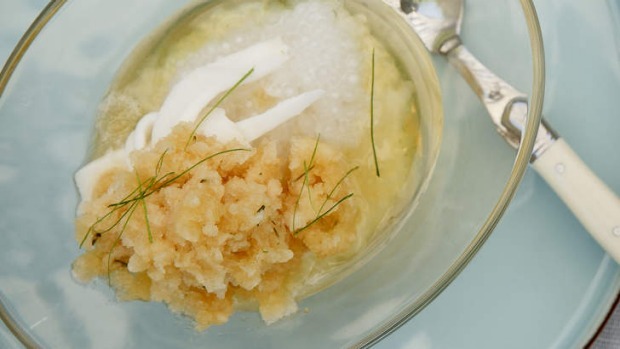 Top the tapioca with coconut flesh, granita and shredded lime leaves. Leftover granita will keep for about two weeks in the freezer. 1. While tapioca mightn't obviously spoil, make sure to use a packet within its best-before date, as it will be far superior to one that has been sitting on the shelf for too long. 2. You can store any extra kaffir lime leaves in a bag in the freezer. 3. Fill glasses with leftover granita and stir through a splash of gin or vodka for a refreshing summer cocktail.